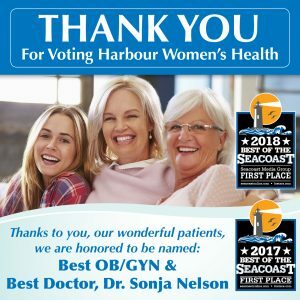 Portsmouth, NH – Harbour Women’s Health is honored to announce it has been named the Best OBGYN in the 2018 Best of the Seacoast Awards for the second consecutive year. The practice is also delighted to announce one of its providers, Dr. Sonja Nelson, was also honored as the winner for the Best Doctor category. In addition, Portsmouth Regional Hospital, where the providers attend deliveries, was named as Best Place to Have a Baby for the second consecutive year. These continued and combined awards make the practice and hospital the most trusted labor and delivery partnership on the seacoast. The Best of the Seacoast Awards honors businesses and institutions on the seacoast which are selected by a public voting process. A reception to reveal winners was held by Seacoast Media Group at the Blue Ocean Event Center in Salisbury, Massachusetts. Located in Portsmouth, New Hampshire, Harbour Women’s Health offers obstetric and gynecology physicians, a fellowship‐trained Urogynecologist, North American Menopause Society (NAMS) certified practitioners, and Women’s Health Nurse Practitioners on staff to care for patients. For over 50 years, HWH providers have focused on both progressive and conventional care, while maintaining a conservative approach to surgery. Harbour Women’s Health supports local community and related women’s causes, including Families First, where Harbour Women’s Health providers offer obstetrical care as part of a collaborative effort with the organization. For more information, visit www.harbourwomenshealth.com.